It’s been close a to a year since the last World of Warcraft novel was released. This Tuesday we’ll be getting another with World of Warcraft: Illidan, by William King, a newcomer to the Blizzard novelizations scene. Have you ever wondered exactly what was going on during The Burning Crusade‘s convoluted story? Pondered what its like to become and live as a demon hunter? If Illidan really is “the Betrayer” everyone makes him out to be? 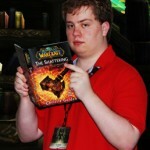 Want to know how William King stands against previous Warcraft novel authors? If you answered yes to any of these, read on! NOTE: This review contains MINOR SPOILERS for the novel. You have been warned. Check out these Azeroth Chopper Gear! Choose your faction! Maybe there will be more Azeroth Choppers Gear. 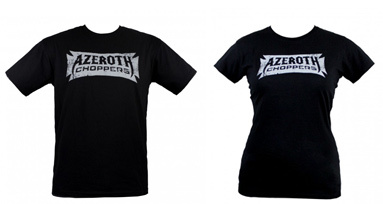 Celebrate all things Azeroth Choppers with a slick oil black tee, available now in both men’s and women’s sizes in the Blizzard Gear Store . 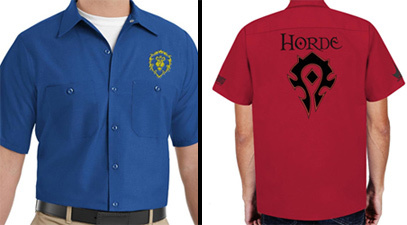 Whether you’re Horde or Alliance, you can also show your pride —chopper style—by donning a button-up PJD Horde or Alliance work shirt and Cap just like the ones worn in the show. Rev up your browser and head over to Paul Jr. Designs Store to make your choice! Eldorian took screenshots of all the Blizzcon 2009 exclusive store merchandise only available to fans who purchased a ticket. There is a plethora of new products never seen before. You can find them after the break. Upper Deck just informed us of their new upcoming WoW TCG: Blood of Gladiators Loot Cards and more importantly the code you can use on PTR 3.1 Servers to have a live sneak peek of what they look like. The first scenario for the WoW: Adventure Game League! Fantasy Flight Games invites players to embark into the latest World of Warcraft: The Adventure Game scenario: Alterac Valley. Heed the call to battle! 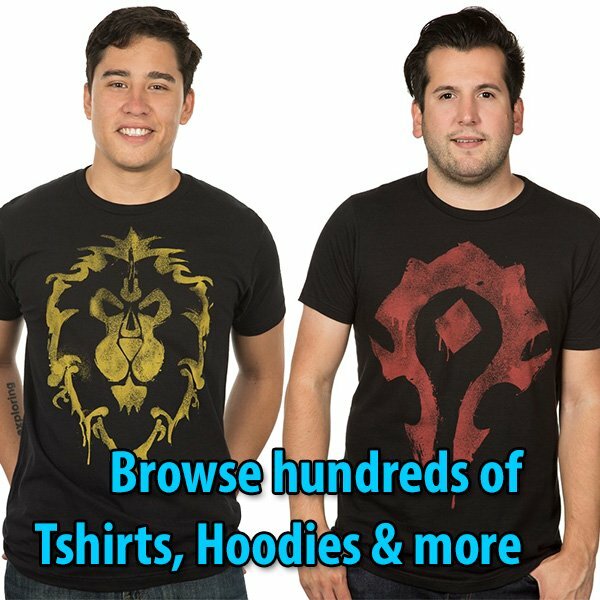 World of Warcraft: the Adventure Game is an exciting and fast-paced journey through the world of Azeroth for 2 to 4 players. Choose your favorite hero and embark on an epic journey from humble beginnings to immense power, battling vicious monsters, powerful overlords, and your treacherous fellow players! Two to four players each take on the role of a Warcraft character. The base World of Warcraft Adventure Game comes with four unique and distinctive characters: Burbonn Fang the Dwarf hunter, Sandrai Darkshine the Human warlock, Sofeea Icecall the Undead mage, and Grumbaz Crowsblood the Orc warrior. Each character is depicted by his own detailed plastic figure and has his own specialized character and ability cards. The call to arms has been sounded. Will you take up arms? This first scenario in the World of Warcraft: The Adventure Game League will force you to reevaluate your tactics, as you must prove yourself worthy through combat. For more information on the league, check out this article. Once you have played, record your information (Include all of the information requested in this news article) and email it to the JR Godwin, League Administrator. World of Warcraft # 15 Preview – Garona Birthed A Half-Human Baby? From the creative minds of Wildstorm’s World of Warcraft comic book writer Walter Simonson (Mighty Thor) and Chris Metzen, Blizzard has released a loregasmic preview teaser of World of Warcraft # 15. After King Varian Wrynn decapitated Onyxia’s corpse to display her head in Stormwind, Garona makes her appearance for the first time since the events from Warcraft: The Last Guardian. The preview reveals that shortly after Garona assassinated King Llane, she found out about her … pregnancy. She gave the baby to an ancient human mage, named Meryl, to raise him. It is now confirmed that Garona was cursed by Sargeras to betray and do things against her will. Therefore, she couldn’t bare to rise her own child for fear she would kill him. This plot brings about so many intriguing questions. Who is the father of Garona’s baby? Medivh? Khadgar? King Llane? On the other hand, Meryl is described as undead, but one who has lived by sheer will and through the use of his own magical powers to prolong his life for milennia; he exists even before Ner’zhul created the Scourge. Is Meryl one of the previous Guardians of Tirisfal? Garona’s baby has grown up, and there is a prophecy behind him found in a scroll digged from Hellfire Peninsula. This child is to become the savior of Azeroth. Do you feel the vibe that this guy, Med’an, is the heir of Medivh? Watch the PDF preview and get that HOT comic book at a newsstand near you! This issue will be on newsstands on January 21. The road back to Theramore begins in issue #15 of the ongoing series. After the events of the last arc, King Varian and Prince Anduin must return home. But who will return with them? And what role will Garona Halforcen play in this next quest? Check out the preview pages. If you like what you see, you can visit Wildstorm for more information, locate a nearby comic store (type zipcode), or subscribe to the series directly.